And how much would you be willing to pay for this service? Currently the site is free, being paid for by advertising (I assume). I can imagine this “field” eventually getting abused. There are many things that might be nice but not likely to happen. I keep a folder on my own computer of my projects with plans, comments, and copies of posts or blogs. I also backup my computer every couple of months. ... as a matter of fact every posting is backed-up; comments made on other pages as well … I’ve been in Corporate America too long! I’ve been here long enough (3080 days it says) to realise, of course, that this is very very unlikely to happen. But I still think it’s a good idea, and would make the site more useful to members, which would help attract more members, which would, of course, make the site a more attractive site on which to advertise. I’m not really sure I see how the field would be “abused” – I guess I could put “bad things” in there, but if only I can see it, well, I don’t really see the problem with that. I just thought I’d throw it out there – the forum tagline says ”...tell us what you are thinking, ...” – this is what I’ve been thinking for a while, so I thought I’d tell them – who knows – ever the optimist! -- "Do not speak – unless it improves on silence." --- "Following the rules and protecting the regulations is binding oneself without rope." -- Have Fun! Joe Lyddon - Alta Loma, CA USA - Home: http://www.WoodworkStuff.net ... My Small Gallery: http://www.ncwoodworker.net/pp/showgallery.php?ppuser=1389&cat=500"
I suspect if they are working on anything at all, it would be a new site. 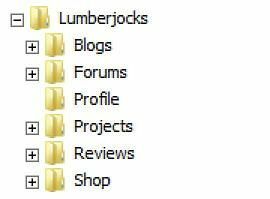 Although if that ever happens I hope they keep the same basic functionality because Lumberjocks was ahead of it’s time and still is for forum software. The gallery, blogs, reviews, etc. are far more advanced than any other website I can think of. It’s ingenious really and I’m surprised others haven’t copied it. I know we occasionally gripe about niggling problems and overdue improvements but this site is pretty much the bomb. I agree with Rock M! I have been to other sites that are based on some “recipe” that is very different than LJs and not as easy to use or view, something akin to a “sterile” environment! Remember the time the mods asked members what changes they would like to see and then did nothing with the recommendations? That was fun. Asking for peoples opinions doesn’t mean it will happen, but does give the designers a glimpse as to what people would like to see. It is something we should welcome, even if nothing ever materializes from the exercise. You probably need to build yourself a private forum. You will have complete control over it and only allow who and what you want on it. People use forums for their own personal use and not for public use like LJ. I’m building one for my free plans site for people that use my plans so they can discuss my plans and their projects. I hope to have it ready not to long after I have my new plans site open. It also has many different skins you can use to personalize it. It’s not a difficult program to use and has an awesome support forum and documentation. You would also need a good web host and domain name and I advise you to stay away from any host under the EIG brand. Google EIG (Endurance International Group) They’re the worst in the industry and have 1000’s of reviews warning people about them. If you already have a website and hosting, you can make a subdoman under your regular domain something to this effect. myforum.mydomain.com or what ever you want to call it. Using a subdomain you can’t use the www in front of it. My new plans forum will be under a subdomain. It sounds a little to me like expanding one’s personal storage which I wouldn’t use for the sake of keeping my information in my control. Everything that I really liked from my favorites I’ve taken screenshots of and made my own notes in my own folder. I certainly don’t think lumberjocks is going to disappear tomorrow but it’s nice to know that if something tragic did happen at least I’d have a few things in my own storage that wouldn’t be gone. The single biggest improvement I can think of would be better search options, as already mentioned I always have at least a little idea of where I need to start my search and the whole universe isn’t it. Ads not coming up as the first two or three results would also be very appreciated! Regardless of anything that may, or may not happen as a result of users making suggestions, I personally think it’s pretty bad form for the powers that me not to at least acknowledge any suggestions that users take the time and trouble to make. Regardless of anything that may, or may not happen as a result of users making suggestions, I personally think it s pretty bad form for the powers that me not to at least acknowledge any suggestions that users take the time and trouble to make. That seems, to me, like an active request for suggestions. where I can write any private comments about the project that I may have. It could go, for example, here…. But then what would I do with all the little scrap notes with critical measurements floating around my shop floor? Trust me, there’s a system! I’m sorry. With our current site, this is not likely to happen. You are correct sir! Sorry, I had never been to the forum homepage for this category. Get yourself an external hard drive to store all of your projects pictures on. Then you’ll be sure to always have them.